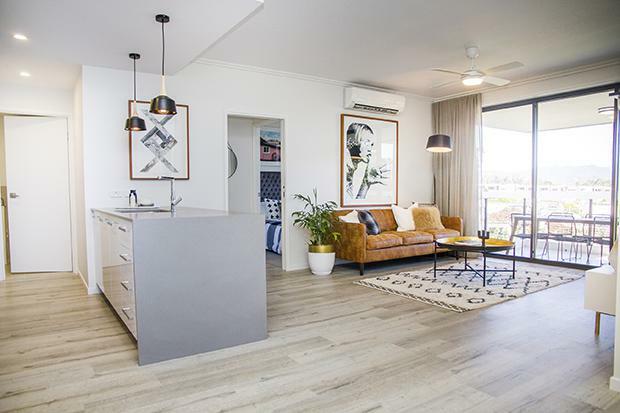 The Robina Group has unveiled a full scale two bedroom display, purpose built to give buyers an opportunity to see the quality of the Bohème Apartment project when buying off the plan. Just weeks after full development and planning approval was received, Bohème Apartments are already close to selling out Tower 1 which features 52 apartments at the gateway to the $200 million masterplanned CityVillage urban community. The Robina Group director Tony Tippett said the Bohème display set new standards for off-the-plan apartment sales on the Gold Coast. "It's extremely rare for buyers to be able to step into a full-scale replica of their apartment before the project has even started construction," he said. "It's easy for purchasers to see Bohème enjoys a great inner city location, surrounded by amenities like Robina Town Centre, educational institutions including Bond University, health facilities, public transport and proximity to the motorway. "However, without a complete display like this they would not have been able to experience the quality of the design first hand. "When our buyers walk into the display they can picture themselves living in a Bohème Apartment. We take great pride in delivering liveable, quality homes with open plan spaces, separated bedrooms and plenty of storage". "Since opening doors to our new display, our sales team have been constantly busy, which is testament to the fact that buyers really want to see what they're buying before committing off the plan and also a sign of demand for quality apartment product, close to major infrastructure." The interior styling of the display has been completed by The Block and Reno Rumble stars, Carlene and Michael Duffy, as they relaunch their interior design company, Cedar & Suede, as an online consulting business and blog. Carlene said the Bohème Apartment display showcases Cedar & Suede's ability to deliver something exciting and unexpected and to deliver resolved, layered and functional spaces. "The two bedroom Bohème Apartment display was a great canvas for us to work with - it really highlights how you can add elements of subtle sophistication to any space and create a home that has broad appeal,” she said. The Block and Reno Rumble stars, Carlene & Michael Duffy[/caption]Mr Tippett said, "The interior styling that Michael and Carlene have provided really complements Bohème's design and speaks to our diverse buyer profile - with everyone from young professionals through to downsizers snapping up apartments.."Bohème Apartments Tower one features 45 two bedroom apartments, from 87sqm to 129sqm, and seven three bedroom apartments, from 114sqm to 153sqm. They are priced from $449,000 for a two bedroom and $499,000 for a three bedroom. For further information on Bohème Apartments at CityVillage, please visit the sales centre, located at The Crest Way Robina, open between 10am and 5pm daily, visit cityvillage.com.au or telephone 07 55 933 911.